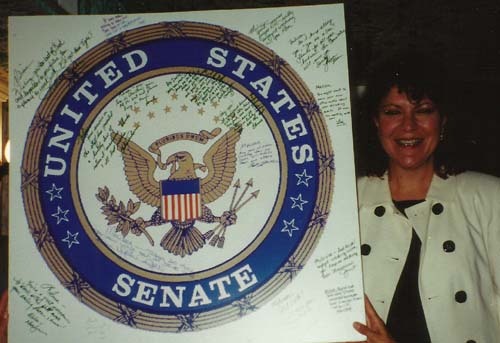 Gower with her going-away present, a U.S. Senate seal with signatures from all Senate Committee on Indian Affairs staff. In the late 1990s to the early 2000s, the Henry J. Kaiser Family Foundation (KFF) and First Nations Development Institute (First Nations) collaborated on the Native American Health Policy Fellowship Program. The program was focused on elevating mid-career Native American and Alaska Native health professionals across the lower 48 and Alaska. There were 14 fellows from 1999 to 2003 who received generous funding support from the foundation, and they worked either in Congressional or Executive Branch offices for one year. First Nations administered the fellowship program, which included Native health professionals from the Cherokee Nation, Lummi Tribe of the Lummi Reservation, Narragansett Indian Tribe, Native Village of Shishmaref, Navajo Nation, Oglala Sioux Tribe, Oneida Nation, Pascua Yaqui Tribe of Arizona, Pit River Tribe, Pueblo of San Felipe, San Carlos Apache Tribe of the San Carlos Reservation, Saint Regis Mohawk Tribe, and Naknek Native Village. Stacey Ecoffey is an enrolled member of the Oglala Sioux Tribe and currently serves as the Acting Deputy Assistant Secretary for Native American Affairs with the Administration for Children & Families (ACF), and the Commissioner with the Administration for Native Americans (ANA) in Washington, D.C.
Ecoffey is the first-ever deputy assistant secretary for Native American Affairs appointed by the ACF in October 2016. She is the main point person within the ACF to give advice, opinion and review policies that impact Native American tribes. 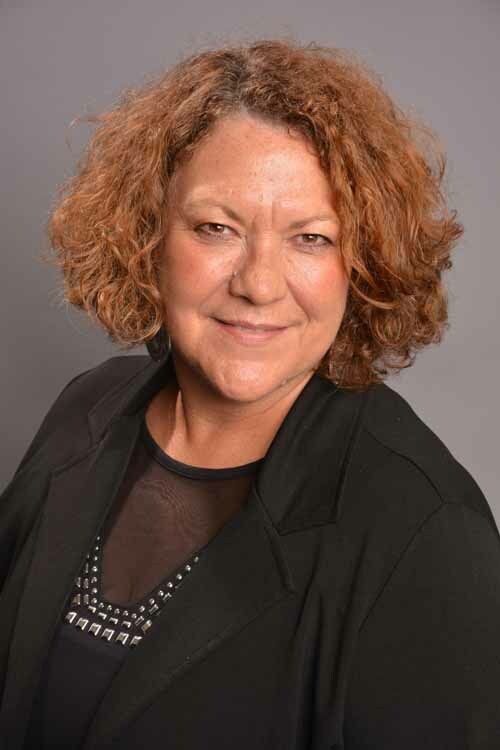 Ecoffey began her career in Washington, D.C., when she had the opportunity to attend a meeting while working with the Oglala Sioux Tribe, of which she is a member and where she was born and raised on the Pine Ridge Reservation. She served as the Health and Human Services Committee Coordinator where she oversaw 37 tribal programs. It was while in D.C. that she realized there was more to working with tribal governments and communities than she had so far experienced. “I had come straight from working with the tribal government. I learned how the tribal government works for my community and my tribe, but there was a piece missing, and that’s what happens on the outside,” said Ecoffey. Always a rez girl at heart, and very grounded in her tribal community and family, Ecoffey realized that there were other things she could do to help her community. She applied for the Native American Health Policy Fellowship, where in 2001 she worked as a Staff Specialist with Intergovernmental Affairs, Office of the Secretary, at the Department of Health and Human Services. She focused her policy research paper and fellowship work on looking at the tribal consultation policy of the department. “I experienced other things in D.C. that I wouldn’t have experienced on my own. The program exposed us to a lot. In the position, I learned that there was more I could do to help tribal communities, and that political leadership could make an informed decision if they could actually see it in action at the local level and at the national level. That first year, it broadened my horizon,” said Ecoffey. During that fellowship year, Ecoffey said, she learned “how to connect with people” and to get out and experience D.C. and hear from tribal leadership from all across the country. After she completed the fellowship she took a position with the National Indian Health Board (NIHB), which was based in Denver, Colorado, at the time. She served as the Project Coordinator for Strengthening Tribal Management Capabilities in Health and Human Service Delivery for two years. Ecoffey enjoyed being only four and half hours away from her family in Pine Ridge, and working at NIHB and “influencing change.” But D.C. would call on her once again, to serve tribal communities at the federal level. Ecoffey went to work for Dr. Charles Grim, Cherokee Nation, who served as the Director of the Indian Health Service (IHS) from 2002 to 2007 under the Bush administration. Her position was a non-political appointment, and she continued to see the benefits and value of the health fellowship for tribal communities. Doing the work on the ground whether in the halls of the government agencies in D.C. or driving the bustling roads that take her back home to South Dakota, Ecoffey knows what’s important to her. Melissa (McNiel) Gower is a member of the Cherokee Nation and entered the Native American Health Policy Fellowship in 1999, after 10 years of working in the area of Indian health care. She served as the Deputy Clinic Administrator for the Wilma P. Mankiller Health Center, a tribally-operated outpatient health center in Stilwell, Oklahoma, and as heath planning specialist and consultant. During her fellowship, she worked in U.S. Senator Ben Nighthorse Campbell’s office with the majority staff. Campbell was then Chairman of the U.S. Senate Committee on Indian Affairs. In the Fall/Winter 1999 issue of First Nations’ Indian Giver newsletter, Gower was described as “indispensable” to the committee. During her time in Campbell’s office, she worked on healthcare, tribal self-governance, and elder and family issues. Gower’s policy interests and paper were on the financing of American Indian health care facilities. “The fellowship gave me a greater understanding of the U.S. congressional and legislative process, and how it works. It was helpful in my future work with the Cherokee Nation – where I started the government relations department and opened their office in Washington,” said Gower. As had many of the other fellows, Gower had grown up in her tribal community and she had never lived anywhere other than Oklahoma. She said it was Sherry Salway Black, then Vice President of First Nations Development Institute, who helped the fellows get acclimated to life in the nation’s capital. Salway Black served 19 years as the Senior Vice President of, and on the boards of directors for First Nations and First Nations Oweesta Corporation. Salway Black is Oglala Lakota and knew the importance of having the fellows based in Washington. 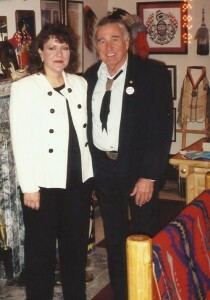 Gower and Senator Ben Nighthorse Campbell. “It was important that this fellowship not only help to broaden the networks of Native fellows beyond Indian Country, but help them to understand how national policy impacts our communities directly. Native people must be experienced and work at every level of government from tribal to state to national – because our communities are affected by all levels of government,” said Salway Black. The fellowship opened many doors for Gower and the opportunity to further her legislative and policy experience, make business contacts and lasting friends. While being in Washington provided an invaluable, professional opportunity, Gower always knew she would return to Oklahoma. “I did get offered a job in D.C., but staying there was never my intent. I was always going to work for the tribe. It was a great experience. I feel blessed and many thanks for the opportunity to participate in it,” said Gower. After completing the fellowship, Gower went on to be an Executive Officer in the Office of the Principal Chief of the Cherokee Nation, where she worked in the areas of strategy, communications, development and governmental relations. Currently, she works as a Senior Advisor, Policy Analyst to the Secretary of Health with the Chickasaw Nation, where she focuses on health-related policy issues at the federal, state and tribal levels. In 2016, Gower was recognized by the National Indian Health Board as one of its National Impact Award recipients for her work and its impact on Native American and Alaska Native people across the country. In all her experience as a healthcare and policy legislation professional, Gower still sees the gap of not enough Native people getting involved in the area of Native healthcare policy. “Another Native American Health Policy Fellowship is needed, as there are very few young people in the field. We need more young people who want to do what I do. The need is there. There are very few people in this niche area – more young people are needed to break into the area. So much goes on, it’s a busy job, and there’s so much at stake – providing American Indian and Alaska Native people healthcare,” said Gower. Jordan P. Lewis always knew he’d work back home in Alaska, and he always knew he wanted to focus his work on Alaska Native elders. What he didn’t know was how his journey would take him to cities across the Lower 48, and have him involved in challenging and unique work experiences along the way. Lewis is Aleut from the Native Village of Naknek, and grew up knowing both his grandparents, and great-grandparents. He says it was growing up around them, and their cultural and social wisdom and knowledge, which greatly influenced him personally and professionally. 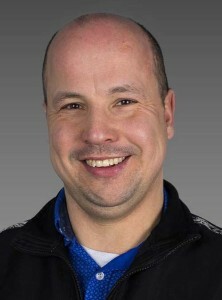 Lewis is the Director of the National Resource Center for Alaska Native Elders and an Associate Professor with the University of Alaska, Anchorage. Dr. Lewis has researched the cultural understanding of aging and the intergenerational programming in tribal communities. “It’s an honor to be respected – to be an elder. The research literature and studies on Native elders is very limited. There’s a different focus to it than what’s currently available on older adults, which is deficiency focused versus what you gain as you age, which is more spiritual and emotional versus a physical deficit,” said Lewis. Lewis speaks with passion and excitement regarding the work he does on behalf of the Alaska Natives across the six regions and 30-plus villages he works with. He focuses on healthy aging and how to help people to learn how to view aging and life in a healing way. “Learning how to network – the networking was phenomenal – and access to the leadership in Indian Country. It taught you how to find your voice and how to stand up for other people, how to be an advocate, to engage, be an effective listener and effective in policy,” said Lewis. He worked with Congressman Frank Pallone, Jr. of the U.S. House of Representatives, where he plunged right into policy work. He was able to see the benefits of influencing policy by being in a position of authority within the congressman’s office. Lewis was also fortunate to be supported by Dr. Yvette Roubideaux, who is from the Rosebud Sioux Tribe of South Dakota, and was then at the University of Arizona. He recalls Roubideaux as a “phenomenal mentor.” Roubideaux currently serves as the Director of the National Congress of American Indians’ Policy Research Center. In addition to Lewis’ strong academic background, he holds a Ph.D. from the University of Alaska Fairbanks, a Master’s of Social Work from Washington University in St. Louis, and a Bachelor’s of Social Work from the University of Fairbanks. He also spent a summer as a Morris K. Udall Foundation congressional intern, and worked with First Nations Development Institute prior to moving to Washington for the Native American Health Policy Fellowship. “I worked there about one and a half years at First Nations as Policy Associate. I was very excited, and it was a busy journey. I worked on forestry and food programs. I traveled and I learned about what was going on with reservation communities, but my interest was with health policy,” said Lewis. Sherry Salway Black looks back at the impact the fellows have had in the area of Native American health policy for tribal communities, and public health and policy sectors.